A teacher asked me about Symbaloo last week. It is something I had heard about many moons ago. 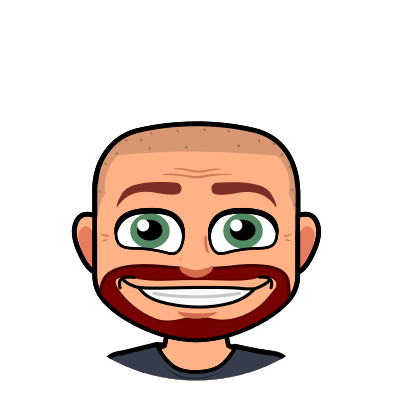 I even watched in a presentation as someone showed what it can do and thought…this is a great tool! Then, as many things go, I never went back to it. Thanks to this teacher, I took some time to play and have discovered how powerful Symbaloo can be! Symbaloo is a free tool that allows you to create a site, which they call a webmix, that allows you to create links to many other websites all from the same page. You are essentially creating and sharing a list of favorites. Initially I saw the value for a classroom teacher. It is perfect for when a teacher wants to share links to resources students will need for a project or lesson. It would also be great for primary teachers to link to games, books, and videos for their young students. All of the sites you want them to have access to can be housed in one place. Thinking about it further I found a great use for me as an instructional technology specialist. Teachers are always asking me about sites or apps I like for product creation. Instead of me either emailing them the information or waiting for the teachers to try to write it all down, I can share via Symbaloo webmix. This ends the risk of it being written down wrong or the teachers finding an app that is similar but not quite what I was sending them to. The webmix below links directly to the app store. If a teacher opens this webmix on his or her iPad, each time he/she clicks a tile it will open to that specific app in the app store on the iPad itself. There is no more searching needed! 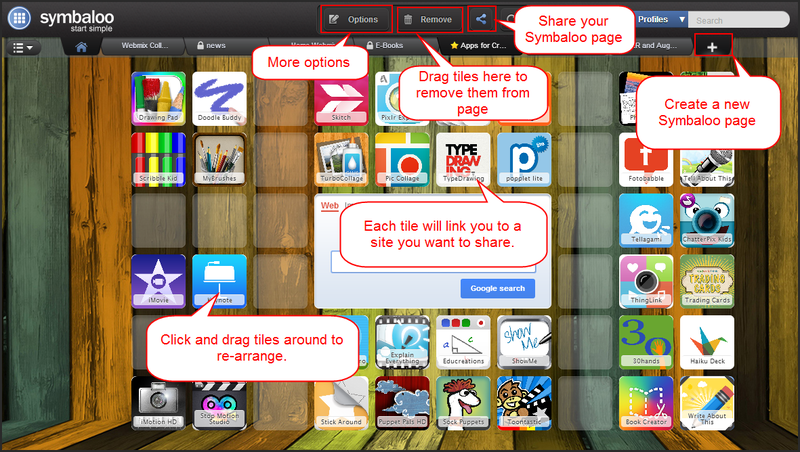 Click the image below to visit my Symbaloo example of favorite iPad creation apps. 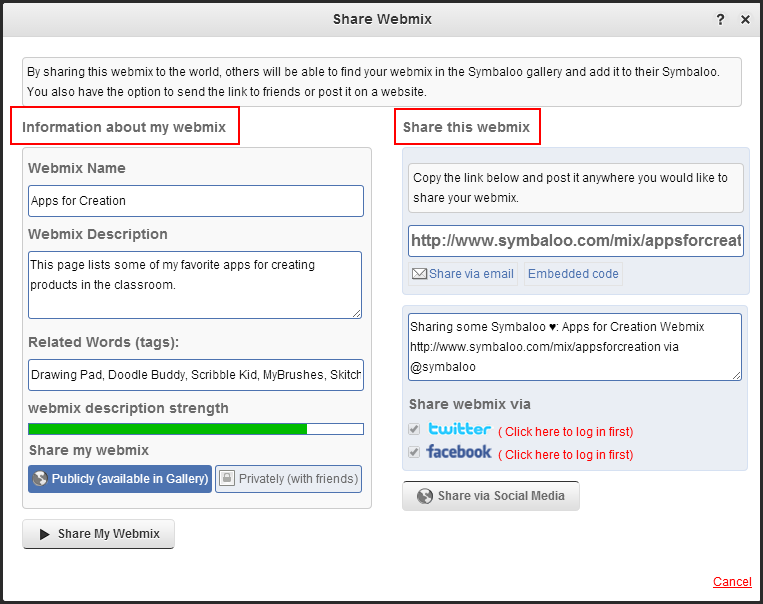 The process to create a Symbaloo webmix is quite simple. Click the “+” tab toward the top to start a new Symbaloo. Name it what you want and you are ready to start adding tiles. To add a site, click on any open tile on your page. A new window will appear. Either type or copy and paste the url to the website you wish to add. A default name will be filled in. You can edit this however you wish. By default, the Name is not shown on the tile. If you want the name to show you must check the Show text option next to the name. Next, choose the style of your tile. Your tile can be a solid color or choose the option to use an icon or image. 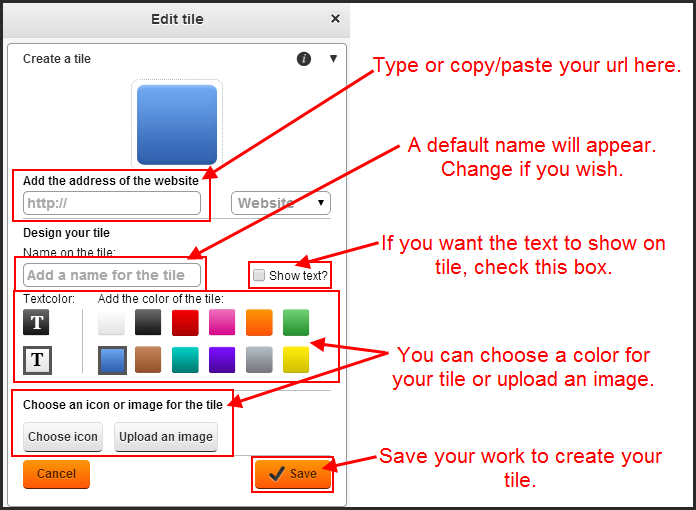 Once you entered the url to the site in the previous step, Symbaloo checks the site for possible image icons and will show those when available. You can also choose to upload your own image to display on the tile. When you are finished, save your work and your tile will appear. Once tiles are created you can easily click and drag them around the page to organize them how you feel is best. If you no longer want a tile on the page, simply click and drag it to the Remove button located at the top of the page. Right-clicking on the tiles also give you many options including the ability to edit that particular tile. The Options button will give you the ability to to rename your page, change the background, etc. Click and explore this button to learn more. When you are ready to share your page, click the share icon at the top. The sharing option lets you add more information to your webmix, such as a description and tags. Fill this in as you see fit. You also have the ability to share from here via email, Twitter, and Facebook. Copy/paste the Symbaloo weblink wherever you need it. An embedding feature is also available should you need it. There are many uses for Symbaloo in education. What will you use it for? ← Tell Everyone with the Tell About This App!